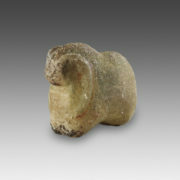 This Statuette of a Wild Sheep or a Ram was carved from a thin stone pebble, which is still partially translucent, despite the current dark and worn appearance of the surface. 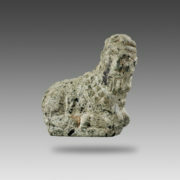 This statuette represents a very popular mythological hybrid figure that was largely widespread in Near Eastern iconography from the Sumerian period. 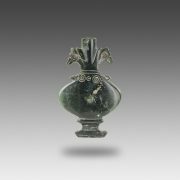 Bactrian Stone Pyxis made of Serpentine / Steatite with Bird-Shaped Lid. 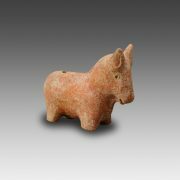 Byzantine Terracotta Horse-Shaped Ryhton from the 5th-6th century B.C. 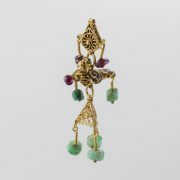 Islamic Earring representing a Bird. 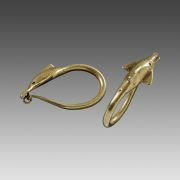 These two pieces of jewelry are characterized by their simple and linear shape: the gold wire forms a loop that tapers towards the clasp and terminates with a small dolphin protome at the other end. 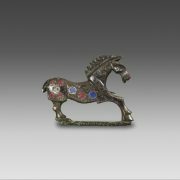 This brooch was modeled in a thin, but strong bronze plaque. It represents a horse with a stylized and simple, though clear outline. 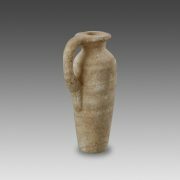 This vessel was carved from a thin and tall fragment of alabaster, finely furrowed with undulated, almost horizontal veins that randomly decorate the surface. 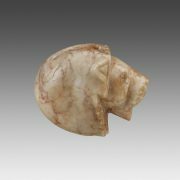 The Seal in the Shape of a Lion’s Head, modeled in the shape of a stylized leonine protome, was carved from a cream-colored limestone veined with red. 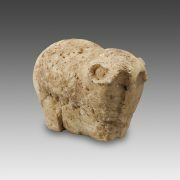 Carved from a small limestone monolith, this statuette is certainly one of the first three-dimensional images of elephant in Near Eastern art; moreover, these large mammals were rarely represented in the rich animal iconography of this prominent culture. 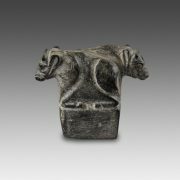 This small, beautiful object is composed of two elements: a parallelepiped that serves as a base for two statuettes of young bulls, whose bodies are merged together and placed head to toe. 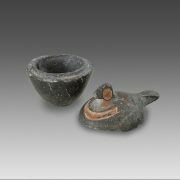 Carved from two fragments of dark green stone mottled with light patches (steatite probably), these two objects represent animals with highly stylized and abstract shapes.